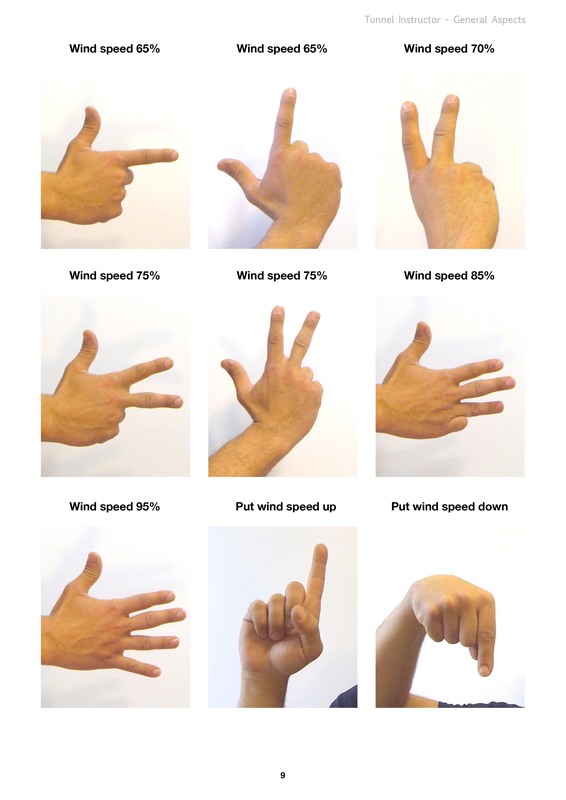 Due to the amount of noise, hand signals are the primary means of communication while inside the flight chamber. 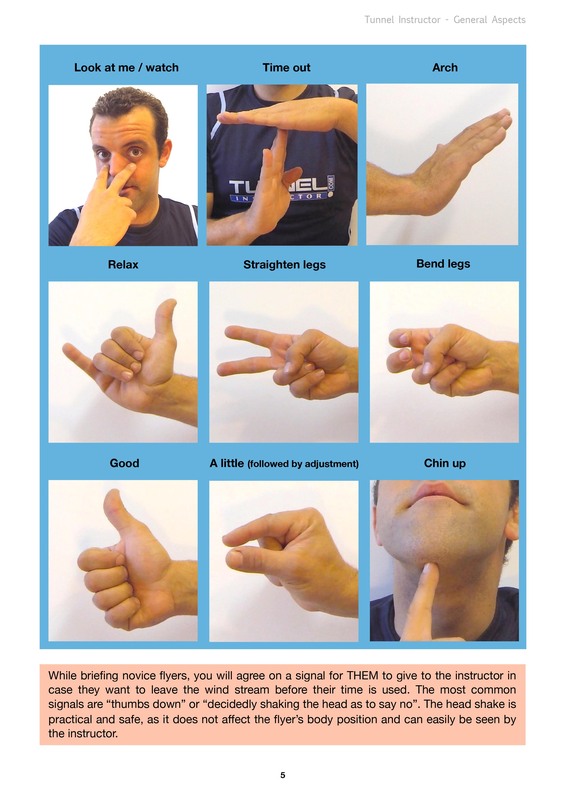 Hand signals can be used to ask questions, give directions or feedback and facilitate the teaching of flyers. Any tunnel instructor should have a good understanding of the need for signals, when to use them and where to place them. For first time flyers, hand signals should be limited to those that help obtain and maintain a stable and relaxed, neutral belly flying position. In order to make this communication successful, briefing prior to flight is key to avoid confusion. There is no need for great detail, and more than often first time flyers perform better when they’re not overwhelmed with too much information. Instructors should try to limit the hand signals for first timers to those displayed on a blue back ground as shown below. 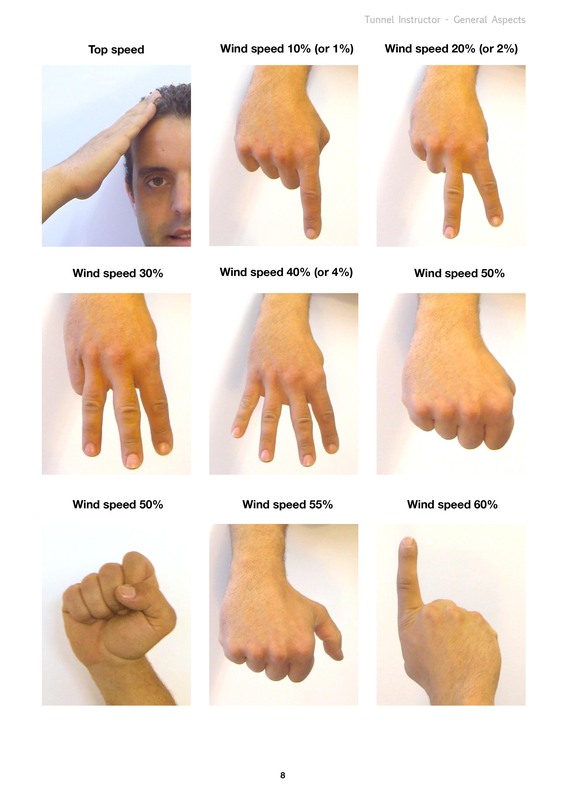 For interaction with more experienced flyers, a wider range of hand signals can be used to teach more advanced flying techniques. Experienced flyers will be more relaxed and will have a better awareness for a greater number of signals, and might even react properly to improvised communication that was not briefed beforehand. Communication with the air flow controller will mainly be about setting the desired wind speed. 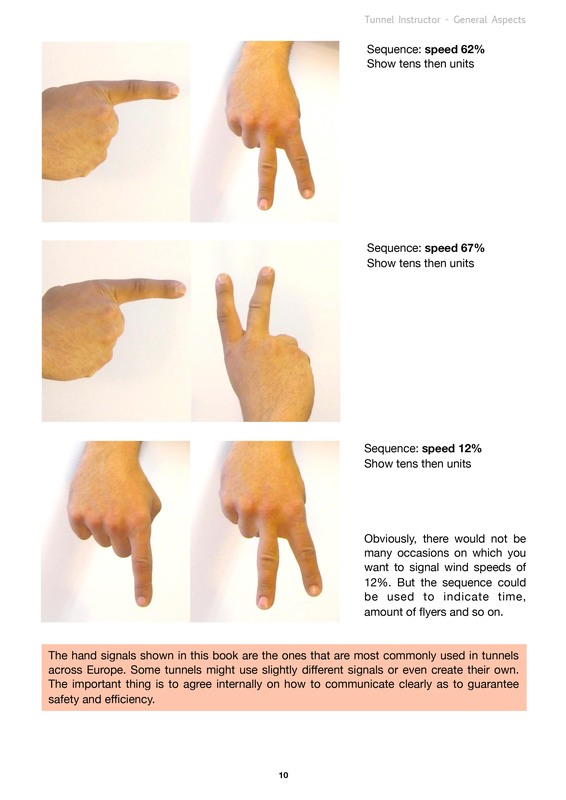 The hand signals as shown on this website and in The Tunnel Instructor Book are the ones that are most commonly used in tunnels across Europe. Some tunnels might use slightly different signals or even create their own. The most important thing is to agree internally on how to communicate clearly as to guarantee safety and efficiency.